Yesterday I attended the Remembrance Day ceremonies at my old school. And I was reminded that teenagers today are a pretty cool bunch. Remembrance Day is a big deal at John McCrae Secondary School; after all the school was named after the war poet who penned “In Flanders Field.” And the school ceremony, and Remembrance Day itself, is an occasion that has always been close to my heart. This is the set up in the gym. I deliberately didn’t crop out the banners high up on the wall, the basketball backboard behind the screen on the right, or the clearly legible court markings on the floor. Yep. It’s a high school gym. But the carefully positioned screens, and the lighting, along with the student artwork, transforms the space for this one morning a year. These large-canvas paintings have been done by the students. With their black and white, and sepia tones, broken only by flashes of brilliant red poppies, they’re fabulous aren’t they? 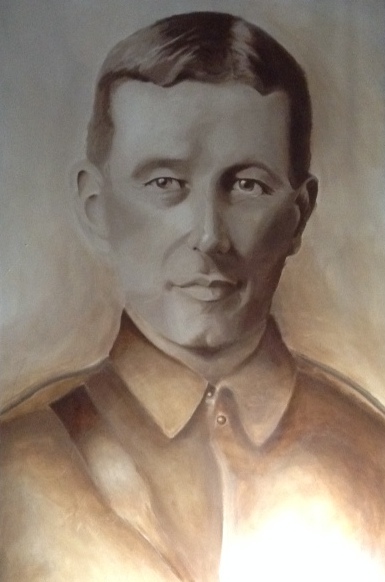 This one is of John McCrae, the school’s namesake. And the one below provides the backdrop for the improvised stage where the students MCs and the various speakers will stand. The ceremony consists of readings of student-written work, songs, and of course a reading of “In Flanders Fields” while background images, and statistics are flashed up on the screen. Then there is the laying of wreaths; that’s why I was there, to lay one of the wreaths. And then the poppy pinning. This is something dreamed up by the show’s organizer Shane Box, one of my former colleagues. 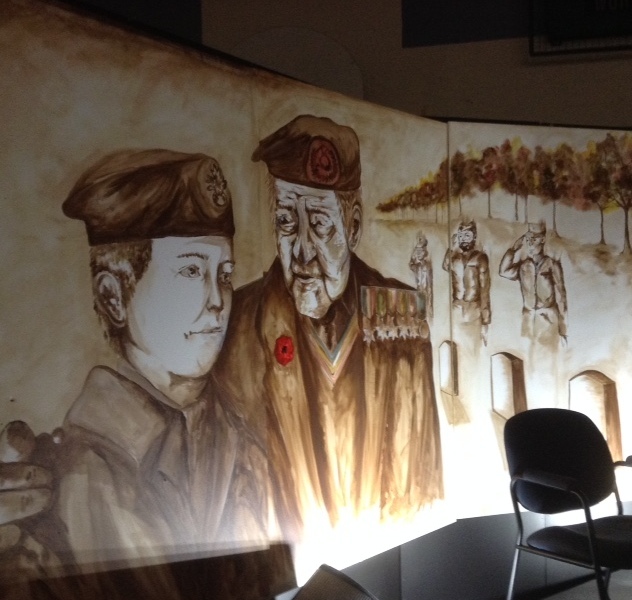 The words “Lest We Forget” are sketched out in white on huge black, fabric-covered panels and grade twelve students pin poppies over the letters to represent soldiers from the various Canadian conflicts. Each war is announced, described, and then the students who are pinning poppies for that war come forward. In the dark gym, under spotlights, the red poppies against the black panels are beautiful. After the school ceremony the panels are moved outside for the community ceremony organized by the local branch of the Royal Canadian Legion. Funds were raised a few years ago to build a permanent monument to John McCrae in front of the school and, now, that’s where the community services are held each year. I should add that the team of JMSS kids and staff and the members of the Royal Canadian Legion was not a happy union that first year. The former soldiers didn’t really want any truck with our more…shall we say… “creative” ceremony, and didn’t really want kids involved with theirs. And the kids and staff (me included) became impatient with their adherence to all things traditional. But it worked out. And now, each year, several Legion members attend and take part in the school ceremony and the students take part in theirs. A very literal passing of the torch which would have made John McCrae, himself, proud. This year, thanks to my friend Evelyn, the art teacher and ceramics expert, JMSS added a new “tradition” to their ceremony. 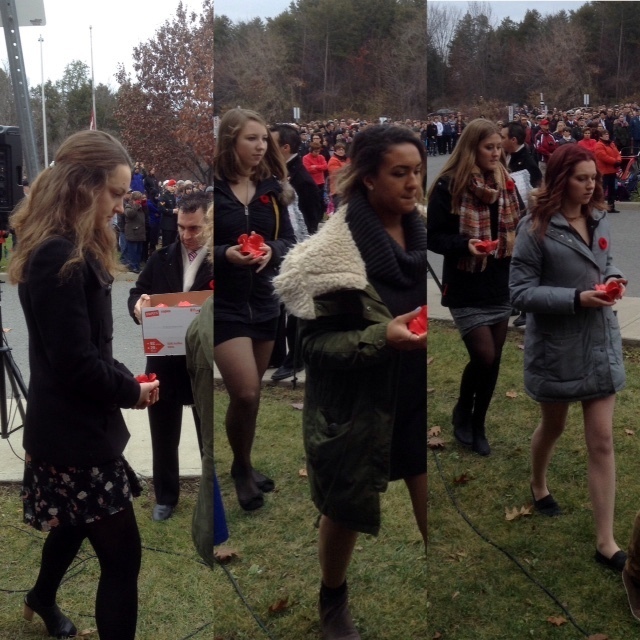 Inspired by the beautiful display of ceramic poppies outside of the Tower of London to mark the one hundredth anniversary of World War I, every graduating student of JMSS, under Ev’s tutelage, made a ceramic poppy. 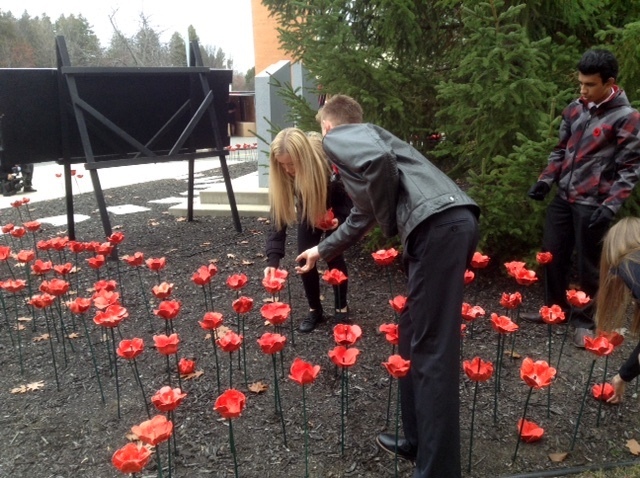 Then during the community Remembrance Day ceremony each student placed their poppy at the foot of the monument. That’s over 250 poppies. Not millions like in London…but pretty impressive anyway. I always get all teary when I see the kids taking their participation in Remembrance Day so seriously. They really do get that whole respect thing, you know. From the Writer’s Craft students who write so beautifully, if a teensy bit too melodramatically, in their fictional accounts of the soldiers’ experiences. High school kids love melodrama, and there’s plenty of fodder for melodrama in writing about war; part of my job as their writing teacher was to convince them that sometimes less was more. To the students who speak, sing, or play during the ceremony. To the rest of the kids in the audience in that darkened gym, standing when they’re supposed to, and sitting quietly the rest of the time. They all understand that they need to be respectful. And let me talk about that darkened gym for a moment. It can be a bit like that wizard of Oz behind the curtain thing, sometimes. The magic just doesn’t come off. Glitches happen. One year the sound system speakers at the back of the gym had almost no volume. Kids sitting at the back quietly strained to hear what was mostly mumbling for the entire hour. Or more than once, students who were speaking missed reading whole paragraphs, and the next person had to ad lib to smooth over the glitch. Or one year someone forgot the tape with the national anthem and a group of senior students quickly moved to the front and lead the school in an acappella version. That was pretty funny. And every year, it seems, the student MC forgets how to pronounce “Reveille”… and calls it “revile.” That always made me smile. And this year was no different. But it’s the glitches, and how the kids scramble to deal with them, that make us remember that these are kids. And look how hard they’re trying to make the ceremony meaningful and… well, perfect. So when someone trips getting on stage in their new high heels, or flubs a line, or when the junior band playing taps misses that note and we all cringe. Or like this year, when the female MC who is five foot eight shows up in her best four inch heels and the male MC at five foot two, grimaces and says to her quietly…” You had to go for the heels, didn’t you?” We teachers smile to ourselves, or to each other. And think that despite the bad press teenagers seem to get these days…. like The Who said… the kids are alright, you know. PrevPrevious storyOf Art and Healing … and Friendship. Beautifully written and timely post Sue. I enjoyed reading it and learning a little about "your school" what talented students and a poignant way to remember ….. 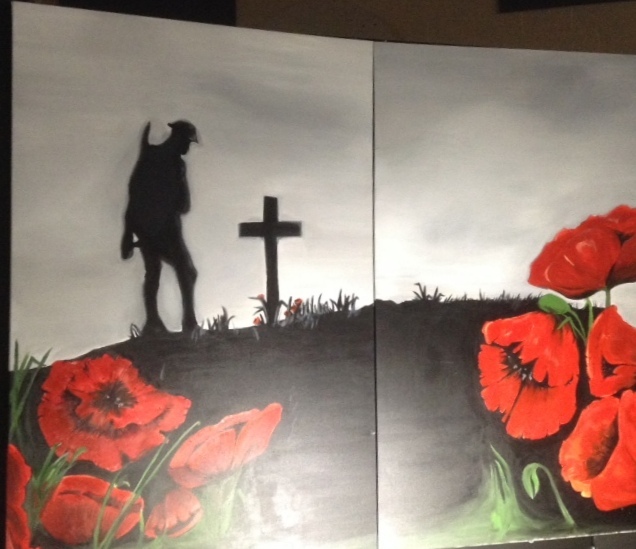 The art work and the poppys look spectacular. I m sure those members of the Royal Canadian Legion who see them must appreciate all the though and work that has gone into the displays. Should be thought and work and poppies! Thanks, Sue, for this moving post. I think that Remembrance Day is treated with more solemnity in Canada than Memorial Day is here in the U.S., perhaps because the latter is regarded as the unofficial start of summer. The losses Canada suffered in the First World War made such a profound impact on the country. When I was in high school in Canada, the war in Vietnam was still on and our teenage selves grew quite emotional in the school ceremonies. It is good to hear that the young haven't been hardened into indifference by the endless cycle of conflicts in this new century. Thanks for that Dianne. I agree. When the kids are researching, writing, or speaking we always stress the losses and the sacrifices and the sheer misery of war… and never the glory. World War I poetry really helps get that point across. Thanks Sue. I prefer how Canadians celebrate this to the US, I remember wearing and seeing eveyone wearing them. It was a poignant reminder, that we don't get in the US. Poppies are still big up here, for sure. A moving post Sue & it's good to see the history of WW1 & its consequences are being taught in your schools . As you say , the young get a bad press . From the media here it is easy to assume that they are all self centered & feckless . I think most of us were self centered at that age until we found our way & started to look outwards , but all the young ones I know personally are coming along nicely – working hard for their future & caring about the world around them . I think you teachers should take some credit for that too . Ah thanks Wendy. I agree. Most of the kids I knew as a teacher and those that I still keep in touch with now are pretty great. I am so grateful when the next generation is taught to remember and appreciate! It gives me hope! Me too, Diane. Thanks for reading. It is interesting that of the many bloggers I read, it was only those living in Europe or Canada who wrote about Remembrance, Armistice, or Veteran's Day this year. Veteran's Day in the U.S. seems to be largely ignored (except by veterans and those close to them, and elected officials). 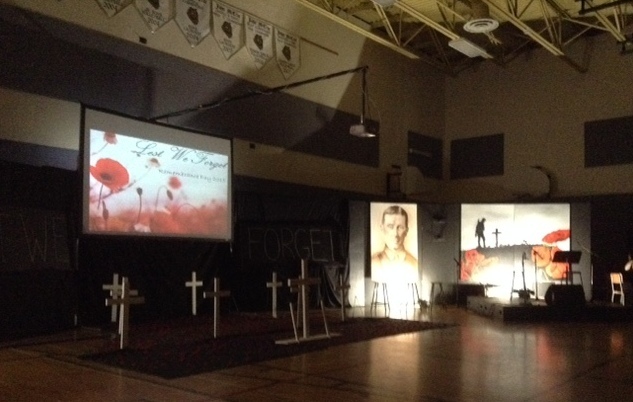 Thank you for posting this essay on the Remembrance Day ceremonies in and in front of John McCrae Secondary School. I will be using the McCrae student participation in ceremonies as an example of what should happen here in the U.S on Veteran's Day. Only by remembering the sacrifice and horror of war will we fully commit ourselves to achieving lasting peace. Exactly my feeling Leslie. And anything written about war by those who were there will stress that…. as opposed to the expressions of politicians…I am remembering GW's thumbs up "Job done!" exclamation. The large canvas paintings are wonderful! Warm greetings from Montreal, Canada. They are aren't they? Thanks for stopping by from Montreal! Thanks Iris. Glad you enjoyed both posts. I've been uncharacteristically serious this week on the blog.